This is one of four reports from the Beyond Abuse project. This document is the report from London. The Beyond Abuse project was a national bid, delivered in partnership with Brighton Rise in Brighton and LGBT Foundation in Manchester. 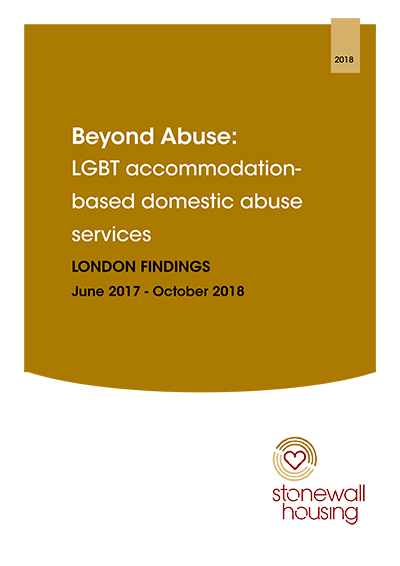 As part of the Beyond Abuse project, Stonewall Housing provided a support service within Hammersmith & Fulham, Kensington & Chelsea and Westminster. Stonewall Housing recruited for three part-time roles, which included a Domestic Abuse Caseworker who offered crisis intervention, housing advice and advocacy, a Tenancy Sustainment Officer who provided floating support to settle clients into their new homes and a Peer Support Worker who delivered 1:1 emotional and therapeutic sessions to clients to help them with their journey.